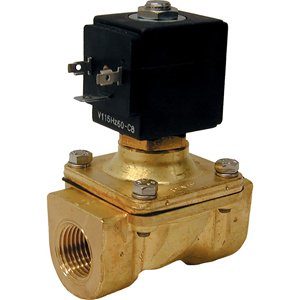 SV-3500 Series 2-way zero differential solenoid valves are internally piloted with assisted lift valves featuring Brass, stainless steel construction and NBR and PA seal material. The temperature range from -10 to 90.5°C (14 to 195°F) is ideal for neutral media such as compressed air, inert gases, and water. Electrical connection options are a 1/2" conduit plug or strain relief connector. 참고: Comes complete with operator's manual, 8 W coil, and cable grip connector.